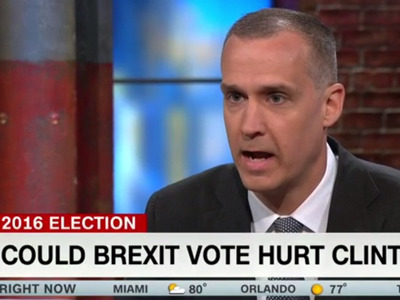 CNNCorey Lewandowski during an appearance on CNN. Corey Lewandowski will be a fierce surrogate on CNN for Donald Trump — if his first appearances are any indicator. During a Monday morning interview on the network, Trump’s former campaign manager exchanged rhetorical barbs with former New York City Council Speaker Christine Quinn over the United Kingdom’s decision to leave the European Union last week. Lewandowski said that Clinton’s opposition to the so-called “Brexit” demonstrated that she fundamentally misread the desires of the UK electorate. “This is Hillary Clinton, who is the secretary of state, who says she has a better understanding of world political affairs than anybody else, and she couldn’t see this vote coming?” Lewandowski asked. Quinn countered that leaders should promote outcomes that benefit constituents, rather than simply identify the politically popular position. But Lewandowski didn’t back off his attacks, saying that Clinton and President Barack Obama were attempting to unfairly influence British voters. “He didn’t weigh in like Hillary Clinton did, like Barack Obama did saying that, ‘You can’t do this,'” Lewandowski said. “He said ‘You can do it because you decide on your own what the right thing to do is.’ And Hillary Clinton had this so wrong that the people rejected her,” Lewandowski said. While just a week ago Trump’s children were pushing Lewandowski out of the campaign, on Monday’s morning shows, their arguments were virtually identical. Appearing on “Fox and Friends” on Monday, Eric Trump said that it was neither Clinton or Obama’s business to weigh in on the vote at all. “She’s supposed to be have her finger on the pulse of what’s going on, and once again she got it wrong,” Trump said of Clinton. The Clinton campaign has maintained that the vote has wide-ranging economic consequences for the US. Speaking to a conference of mayors in Indianapolis on Sunday, Clinton slammed Trump’s response to Brexit, claiming that the results of the vote took a $100 billion toll on American retirement savings accounts on Friday. “We are resilient, and we will bounce back from this and from all of the other shocks that are in the system. But it is a reminder that what happens around the world has consequences that can hit home quickly and affect our lives and our livelihoods,” Clinton said.